Hand-made Japanese pottery utilizes traditional crafting skills and techniques. These pieces are not intended for use in the dishwasher or microwave, both of which can damage the chawan. 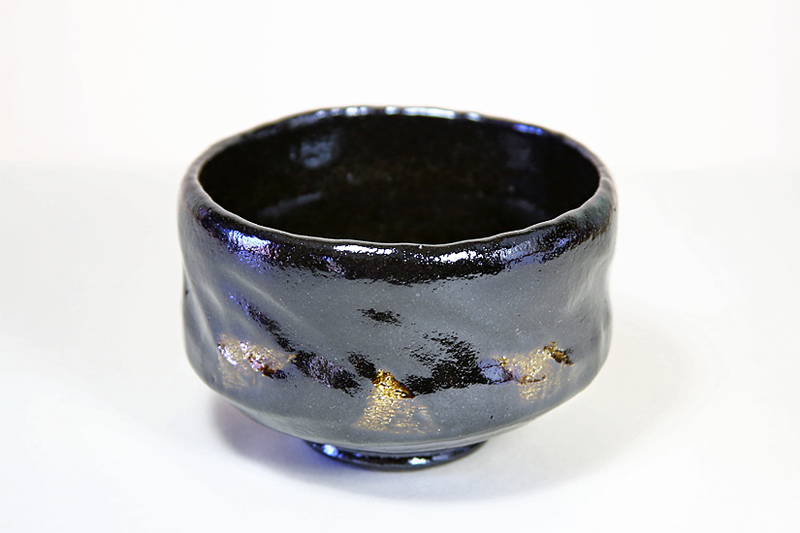 This stunning black (kuro-yaki) Matcha bowl is stylish yet restrained. Despite it dark and somewhat brooding demeanor, the weight of the clay is light and soft in the hand. The bowl is accentuated around the diameter with indentations that might be that of the potter pressing his thumb lightly into the clay. These slight but regularly placed marks work in harmony with the shiny glaze to create an impression of watery movement in the current of a slow moving stream. Three patches of brown-gold color on the face of the teabowl peek out from the front of the bowl. The effect of this color is as if a curtain, momentarily lifted, has allowed us a glimpse of something far away and mysterious. This tea bowl was made by Shoraku Sasaki III in the kiln bearing his family’s name in Kame-oka near the Yada shrine, Kyoto. His grandfather built a kiln in the vicinity of the Kiyomizu Temple in Eastern Kyoto. In 1945 the kiln was moved to the current site. 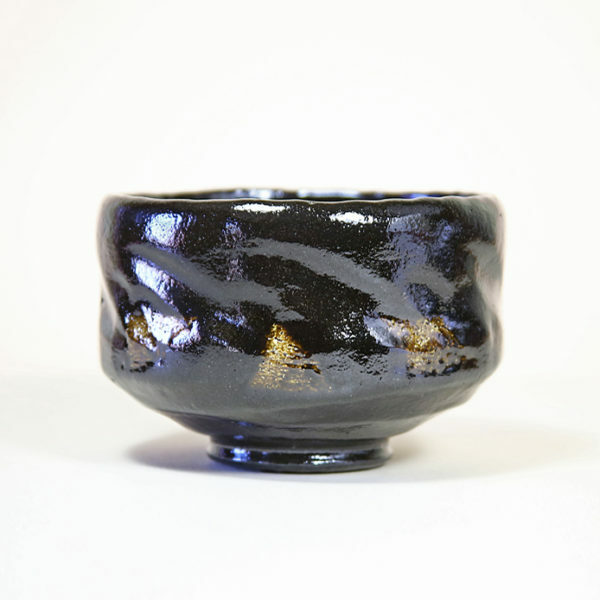 Shoraku’s name was given to him by the head priest of the Yada shrine, and now his grandson – Shoraku Sakai III – has the title and continues the tradition of producing raku tea bowls. 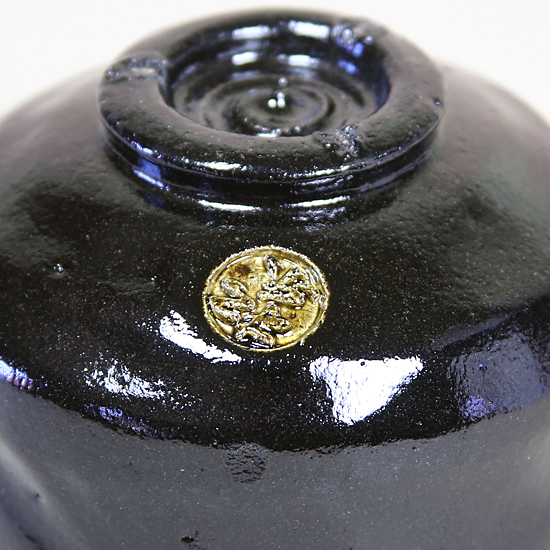 Shoraku Sakai’s signature seal rests prominently on the bottom of the bowl in the brownish-gold glaze. Raku tea bowls are made by hand, without the use of a potter’s wheel. The potter works the clay with his hand raising the sides of the play while holding and coddling the shape of the clay with his hands. Raku tea bowls can vary considerably in bowl size, footring design and width of the bowl, but the rim of the bowls are always be made with the tea drinkers ease of drinking in mind.